Over the past two years we've seen EBP develop and grow in a platform to assist our customers with bills, missed payments some debts. It's time to really focus our efforts and the first step is a major rebrand. We're the same great people with the same great service. We've updated the website and in 2017 we'll be working on more features. Want your bills paid on time? It can be done for less than a dollar a day. "I must say I'm a little more at ease and not stressing as much knowing these bills are all taken care of! Should have done this a long time ago !" Elke "Life saver. It was a life changing experience to me and to my family. They don't just prepare the statement, they take you through in to your life and see all the corners of your Expenses and Income and make it clear, and make you walk through the tunnel and you can see the light at the end of your tunnel. 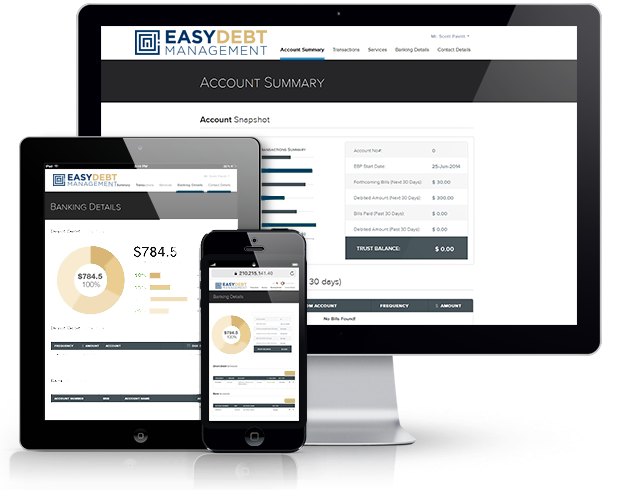 Their Easy Debt Management system is mind blowing." "Easy Debt Management is a great thing. Gone are the worries of finding money to pay the bills. Paying my debt is now made easy and affordable and gets me off the paying peter to pay paul treadmill. Thank you." © Copyright 2014. Easy Debt Management. All rights reserved.